This is my country. This is Kungkarakalpa Tjukurpa (Seven Sisters). Secret Country for women. The seven sisters were stopping close up to Kura Ala. The women were travelling all over running away from Wati Nyiru. He was a lustful, cheeky man. Kunmanara (Wingu) Tingima was born at Nyumum, the site of a sacred men’s place in the Great Victorian Desert. She grew up in the bush before later travelling on foot with her parents to the community established at Ernabella where she learned to spin wool at the Ernabella Arts centre. 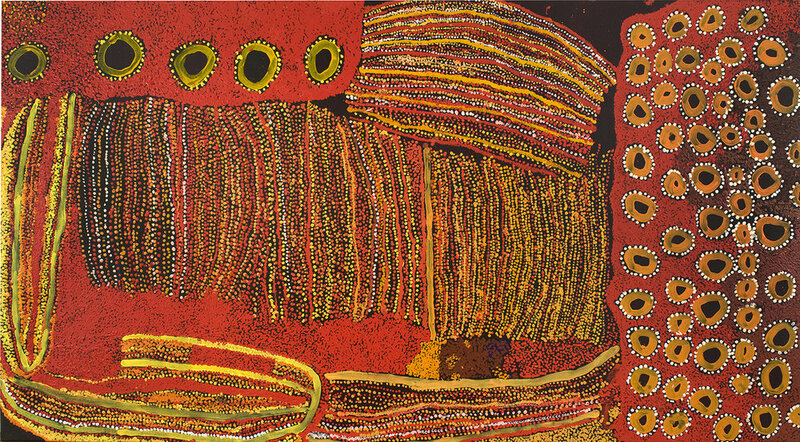 In 2001 she was instrumental in the formation of Irrunytju Arts, an arts centre supporting painting by artists from the Western Desert at Wingellina, approx 12km west of the Western and South Australian borders. She later moved with her family to Nyapari and with a group of senior artists, established the Tjungu Palya art centre.